Published Aug 31, 2017 By Julia 8 CommentsThis post may contain affiliate links. 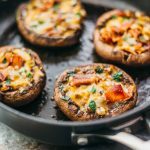 These easy and low carb portobello mushrooms are stuffed with cheddar cheese, onions, and crispy bacon. 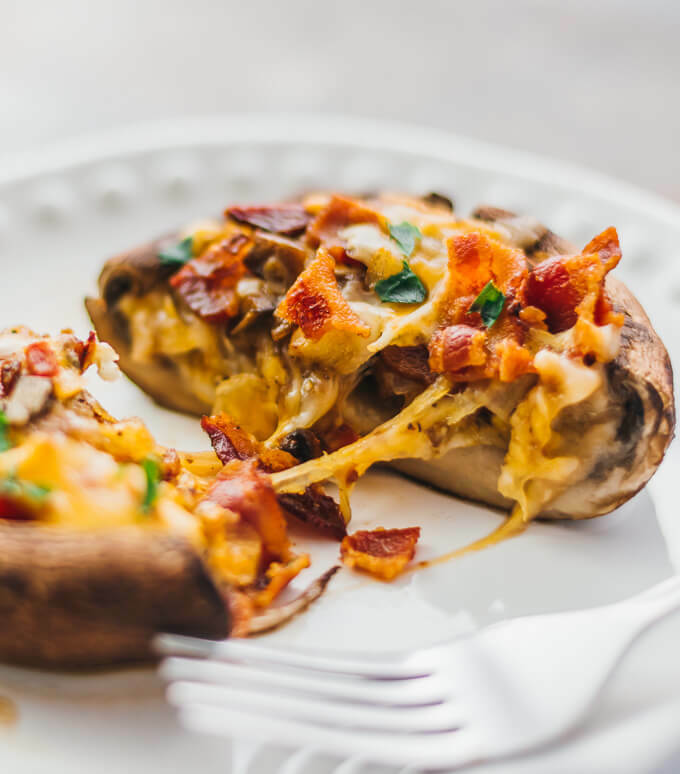 Make no mistake: these are no ordinary stuffed mushrooms that you might munch on at a work function. 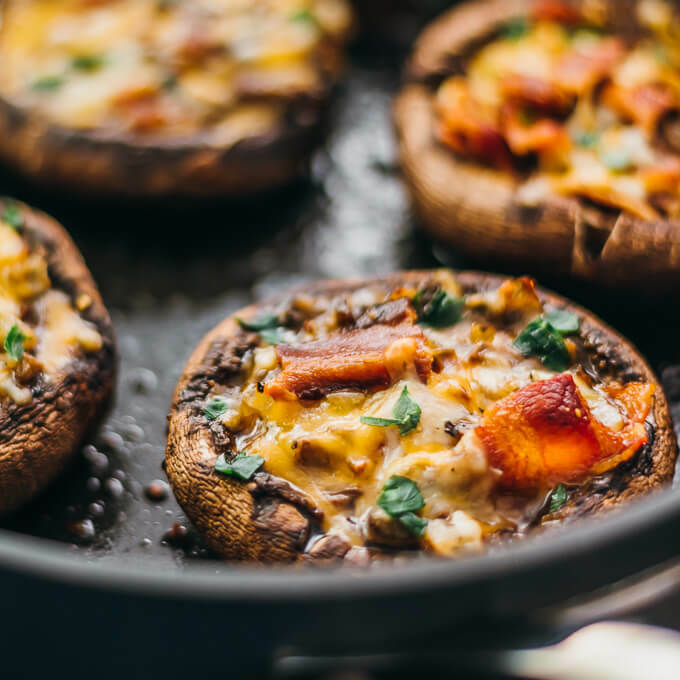 These are hearty and meaty stuffed mushrooms, with extra crispy bacon and lots of cheese stuffed together in giant portobello mushroom caps. I eat these mushrooms as my dinner’s main meal and not as an appetizer, and I slice into them like a fine steak. 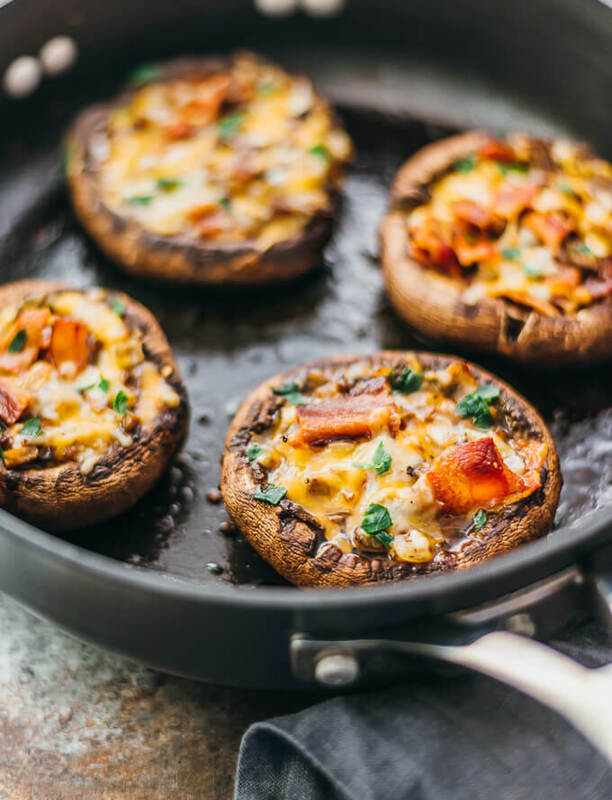 They’re simple, easy to make, and you only need a single pan — first, cook the bacon until crispy, then cook some diced onions and mushroom stems, then stuff the mushrooms, and lastly place the stuffed mushrooms back on the pan and bake until cooked through. These stuffed portobello mushrooms are also good for you, as they’re very low in carbs, about 5 grams per serving. Mr. Savory Tooth and I are on a crusade to put “loaded baked potato” toppings on everything. What does that mean, you ask? For us, it means putting cheddar cheese and extra crispy bacon on top of, well, almost anything. That means you get things such as this loaded potato soup with bacon and cheddar, these bacon wrapped jalapeño peppers with cheddar and cream cheese, Mexican pasta salad with bacon and cheddar cheese, and the list goes on. 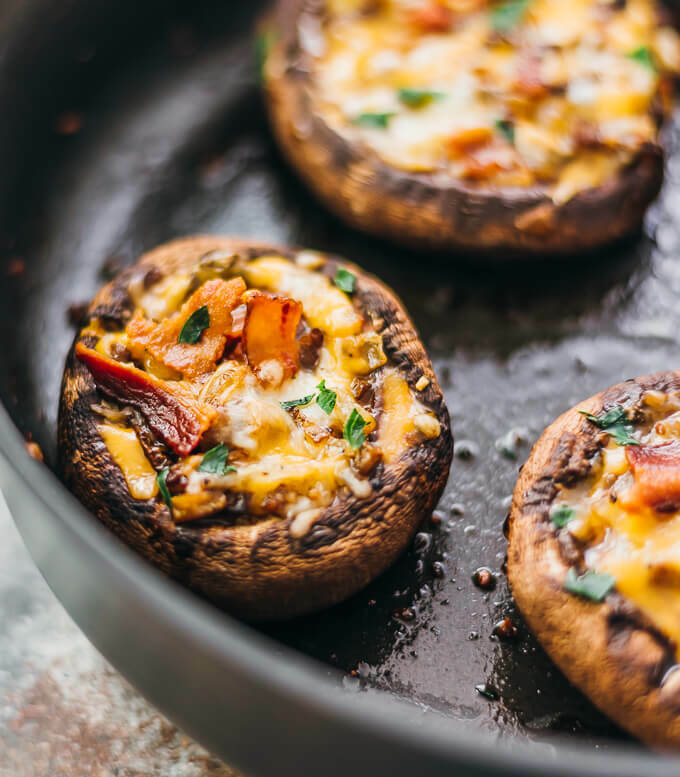 The latest victims to fall prey are these stuffed portobello mushrooms, which go so well with the bacon and cheddar combo that I can’t believe I didn’t think of it earlier. Besides, these stuffed portobellos are refreshingly low in carbs, which means they’re good for you. I use portobello mushrooms because I find it’s much easier to wash, prep, and stuff four large mushrooms instead of twenty-five small mushrooms. I also enjoy slicing into the stuffed portobellos as if they were a fine piece of steak. If you prefer the smaller mushrooms, which I admit are much easier to eat as you can just pop them one-at-a-time into your mouth, you can substitute with equal weight of baby bella mushrooms. Mr. Savory Tooth and I are bacon-obsessed fanatics, so crumbled bacon was the obvious choice for the meat. Extra crispy bacon gives a satisfying crunch to every bite, which nicely complements the meltingly tender cheese. It’s also easy to substitute bacon with something else that you prefer — I’m thinking that both sausage and ground beef would work well. If you’re looking for vegetarian stuffed mushrooms and not this hearty meaty variety, I would check out these cheese stuffed mushrooms that are filled with bread crumbs, asiago cheese, and oregano. Or if you’re just looking for more ways to use mushrooms and not necessarily stuffing them, a great way is to incorporate them into your next risotto: check out this pesto risotto with portobello mushrooms and peas and this butternut squash risotto with mushrooms. Cook bacon strips in a wide oven-safe pan (10 inches in diameter or larger) over medium heat until crispy or to your preference, 5 to 10 minutes, turning occasionally. Transfer bacon to a paper towel to drain. When cool, crumble into small pieces. Dice the mushroom stalks and add them to the pan over the bacon grease. Add diced onions and minced garlic. Cook over medium heat until the onions are browning and crisping, about 5 minutes, stirring frequently. Remove the pan from heat. Transfer the pan’s mushrooms and onions to a large mixing bowl, leaving any oil in the pan. Add shredded cheese mix, salt, and pepper to the mixing bowl, then stir until well-mixed. Stir in the crumbled bacon. Stuff the portobello mushrooms with the mixture. Place the stuffed portobellos onto the same pan, arranging them side-by-side. Transfer the pan to the oven and bake at 350 F until the portobellos are cooked, about 20 minutes. Optionally garnish with fresh chopped parsley. For the portos, do you remove the gills or just the stems? Thank you! That’s bizarre. I’ve never had stuffed mushrooms, portobello or baby sized, go flat after baking. How are you de-stemming your mushrooms? Delicious. I also made this with ham instead of bacon and used up a little Gorgonzola I had hanging around in the fridge! Worked great! These are low carb perfection! Always looking for nice keto-friendly, flavorful options and this is definitely one of em. Love! You were right when you said that these were no ordinary mushrooms. These are absolutely amazing! Thanks for sharing this.